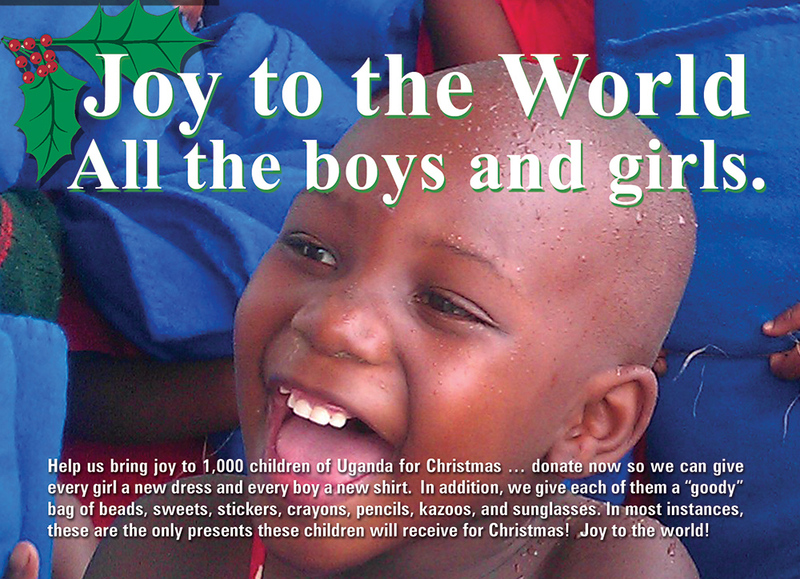 Help us bring joy to 1,000 children of Uganda for Christmas! Donate now so we can give every new girl a new dress and every boy a new shirt. In addition, we give each them a “goody” bag of beads, sweets, stickers, crayons, pencils, kazoos, and sunglasses. In most instances, these are the only presents these children will receive for Christmas! Joy to the World! The students at Mbiriizi Advanced Primary and Day Care School have adopted Sylvia Allen as their “Grandmother,” and Sylvia has adopted them. The school has grown and the needs have grown with it. Where once there were 439 students, now there are over 1,000; 25% of them are orphans. Each year, Sylvia’s Children celebrates Christmas at the end of their school year with a party. It takes so little to bring joy to these children… one shirt, one dress, and two “goody” bags will make two children joyous for $45. A dress for a little girl costs $17 or a shirt for a boy is $13. Goody bags of treats cost $7.50 each. If you would like to donate $500 we can afford meat for the Christmas Party. And for a generous gift of $900 we can bring gifts to 75 P-7 students and 50 faculty. Thank you in advance for your gift and may your year be joyous! PRINTABLE PDF TO DONATE FOR CHRISTMAS!